A Marie Curie grant of the European Commission (RUDEFOPOS-IRAQ, no. 618773) provided support for this research. I am grateful to Nathan Hodson and Hadi Jaafar for discussions on data collection and analysis. A Marie Curie grant of the European Commission (RUDEFOPOS-IRAQ, no. 618773) provided support for this research. The grant making institution was not involved in the conduct of the research. The author declares that there is no conflict of interest. All procedures performed in studies involving human participants were in accordance with the ethical standards of the institutional and/or national research committee and with the 1964 Helsinki declaration and its later amendments or comparable ethical standards. An ethical review committee of the grant making European Commission went through the research design and ensured its compliance with ethical standards of human subjects research. 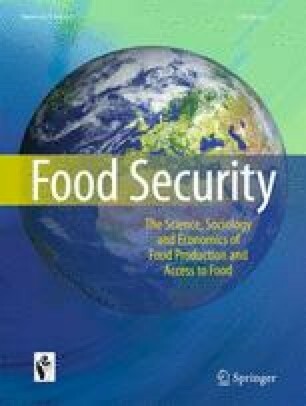 An Institutional Review Board (IRB) approval of Princeton University was obtained for archival research on Iraqi food security. BP. (2015). Statistical Review of World Energy, 2015 http://www.bp.com/en/global/corporate/about-bp/energy-economics/statistical-review-of-world-energy/statistical-review-downloads.html. Accessed 9 Oct 2015. Foreign Policy Magazine, & The Fund for Peace. (2015). The Fragile States Index, 2015 http://fsi.fundforpeace.org/rankings-2015. Accessed 5 Feb 2016. Gallup. (2016). Gallup world poll. Iraq data, 2008–2015 http://www.gallup.com/services/170945/world-poll.aspx. Accessed 4 Feb 2016. Gibson, G. R., Taylor, N. L., Lamo, N. C., & Lackey, J. K. (2016). Effects of Recent Instability on Cultivated Area Along the Euphrates River in Iraq. The Professional Geographer, 1–14, doi: 10.1080/00330124.2016.1194216. IFPRI, Welthungerhilfe, & Concern Worldwide. (2015). Global Hunger Index: Iraq. http://ghi.ifpri.org/countries/IRQ/. Accessed 6 Nov 2015.
International Organization for Migration (IOM) (2015). Iraq Mission. Displacement Tracking Matrix. http://iomiraq.net/dtm-page. Accessed 7 Oct 2015.
International Trade Center. (2016). Trade Map Statistics. http://www.trademap.org. Accessed 5 Feb 2016. Schweitzer, M. (2013a). The destruction of Iraq’s intellectuals. Al Jazeera, 1 October. http://www.aljazeera.com/humanrights/2013/10/destruction-iraqs-intellectuals-2013101114937748151.html. Accessed 3 Mar 2017. Schweitzer, M. (2013b). Iraq ten years on: Ivory tower under siege. Le Monde Diplomatique, 5 March. http://mondediplo.com/outsidein/iraq-ten-years-on-ivory-tower-under-siege. Accessed 3 Mar 2017. UNHCR. (2016). Syria Regional Refugee Response. http://data.unhcr.org/syrianrefugees/regional.php. Accessed 26 June 2016. World Bank (2005). Considering the future of the public distribution system. Executive Summary, Economicand Social Development Unit, Middle East Department. Washington D. C. http://siteresources.worldbank.org/IRFFI/Resources/ExecutiveSummary-PDSReportJune2805.doc. Accessed 3 Mar 2017. World Bank, & International Finance Corporation (IFC). (2016). Ease of Doing Business Index, 2016 http://www.doingbusiness.org/data/exploreeconomies/iraq/. Accessed 5 Feb 2016.